SUBHEAD: Our Federal, State and County governments are not going to protect us from the dangers ahead but be a part of them. 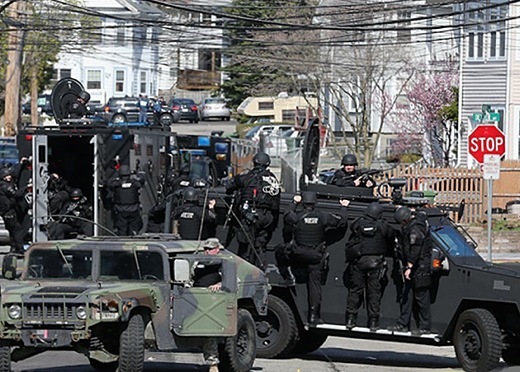 Image above: SWAT teams and military operating in Watertown, Massachusetts in the aftertmath of the explosion of two backpack pressure cooker bombs on 4/15/13 in the cityof Boston by two young brothers. The region was under the control of what could only be called a police state operation that included federal, as well as regional and local militarized units. Constitutional rights were abandoned. This could happen anywhere in America during a "disturbance". From (http://www.theguardian.com/world/gallery/2013/apr/19/boston-police-watertown-in-pictures). A combination of man-made factors have created a situation so dire a threat to the status quo that the subject cannot be spoken of in polite company or even contemplated in private without unpleasant emotional after effects. The problems that face humanity are multiple but originate in techniques we have developed for exploiting the environment for irreplaceable resources - and then consuming, burning or trashing those resources. Initially, when we were hunter-gatherers, our exploitation was in the form of driving to extinction easily hunted mega-fauna. later is was deforestation to allow for agriculture based on annual grains to be grown (primarily rice, wheat, corn). Then in quick succession we used timber for fuel followed by coal, then oil and natural gas. These energy exploits have just about used up the hydrocarbons of a hundred million years of sunlight in just a few centuries. After the implementation of agriculture and prior to the use of hydrocarbons the human population remained well under a billion. But subsequently we have demanded more and more of the of the planet to support our growing numbers. The mechanization, energy, fertilizer, and pesticides available with those hydrocarbons permitted the expansion of human population to reach seven-billion. It is no longer a case of human settlements being circled and whelmed by the surrounding wilderness. We have tamed Earth and now allow wilderness only into designated preserves that don't have oil or natural gas reserves. And even then those sacred "wild" areas have been overwhelmed by trekkers, campers, off-road bikers, and vacation RVs. Even the environmentalists are out in the wilderness fitting wildlife with ID tags, radio collars and head-cameras in order to "save" them. Is that the sound of an Exxon helicopter overhead? How about we stop entering the wilderness and instead begin to convert human settlements into something wilder? Without relief, the response by nature will shortly be to throw humanity off its back like a dog shaking off fleas. To my way of thinking the definition of vermin is too many of any one creature in a place. In our great numbers humans have become vermin. Relief is coming to the planet. Unfortunately, because of our delay of half a century in handling the problem ourselves, Nature's solution will be quick and widespread. It will be to transform much of the planet into a place inhospitable for those creatures larger than micro-organisms (with the exception of rats, roaches and crabgrass). In the meantime, to keep us sated, we comfortably watch our various flatscreens, tablets and phones in the air-conditioning while snarfing on "Soylent Orange" - the industrialized GMO corn substitutes for food. "Soylent Orange" includes the patties of GMO-corn fattened chicken-beef-pork meat-like substances that we flush-down with a 64 ounce carbonated cola sweetened with GMO high-fructose corn syrup. And don't forget to get a bag of "Flamin' Hot" crunchy puffed GMO-corn Cheetos for between meals. I used to call this phenomena 'Soylent Yellow" after the color of corn, but I have recently preferred 'Soylent Orange" after the color of Cheetos. The response of human society to the Problem highlighted above has been funny and tragic. Besides the expected self-denial and lethargy there has been a tsunami of techno-optimistic claptrap about desktop fusion running our computers and green algae filling our gas tanks. The most profitable sectors of our economy have employed the creation of money out of debt (banking) and the investment in diminishing returns (energy industry) to be productive. But even these profit centers are faltering. Needless to say these are suicidal distractions from the real solutions. The real solutions seem outside of the purview of government, industry and the military. While trans-national corporations are running all three of these sectors - they are running on fumes. There simply is not enough cheap energy to keep all the balls in the air. As a result all these sectors are "going medieval". By that I mean they are expecting and participating in a transformation of our current industrial nation states that espouse democracy and the rule of law into a neo-feudal oligarchy controlled by a privileged elite. FEDERAL: In the United States, since 2001, the post-traumatic stress of 911 has allowed a trade of our freedom for greater security. Torture, murder, drones and other abominations have been directed not only at our foreign enemies but at our own citizens. We now have several federal agencies that are arming themselves to contend with the American civilian population as an enemy of the state. The Department of Homeland Security (DHS) and the Transportation Security Agency(TSA) is only the tip of the iceberg. There is also the Drug Enforcement Administration, The Bureau of Alcohol, Tobacco, Firearms and Explosives (ATF). These departments have been militarized by arming up and adding increasingly heavier armored equipment. Even the United States Department of Agriculture (USDA) is engaged in militarizing itself. Is this to protect crop fields of Genetically-Modified-Organisms (GMOs) from organic farmers or cow feedlots from People for the Ethical Treatment of Animals (PETA) members? One wonders. Efforts to protect financial banking interests above the that of American citizens continues with about $100 billion of bailouts every month with lending set at zero percent. What ponzi-bank crime syndicate couldn't make money with that backing? And where does the money come from? Stripping social safety nets, leading college student into penury, driving the middle-class into poverty. STATE: The government of the state of Hawaii has made every effort to pander to the military, corporatists, speculators, developers, and sleazeballs with such promotions as the Hawaiian Superferry in 2007. That was a deal to have the Hawaii use public funds to promote the development of a prototype navel littoral combat vessel that would be used as a commercial ferry and means to transport the Stryker Brigade armored vehicles throughout the state. This was beaten back by public outrage. In 2011 Governor Abercrombie tried to set up The Public Land Development Corporation (PLDC). The PLDC was supposed to let private speculators develop public lands in partnership with the state to generate revenues through the Department of Land and Natural Resources (DLNR). This might include industrial development, fuel farms or even casino resorts (if a Native American label could be assigned to Hawaiians through legislation). This too was beaten back by public outcry. Recently the Governor has moved to make it easier in an "emergency" or "disaster" to have our constitution abrogated. A proclamation of such a state of affairs would allow state and county agencies to interfere with control of private property, guaranteed freedoms, and other rights. Do not expect any help from our state government to make Hawaii more self reliant, sustainable or ecologically sound. COUNTY: The government of the County of Kauai has been at odds with the residents of the island for some time. The property taxes levied on residents are a primary source of income for county employees. They must cover overtime and pension benefits as well as perks like vehicles and gas-cards. The county government appears to want less democracy for Kauai if that could be arranged.That would help give the green light for every half-baked scheme to monitize the island. Not only were they attempting to increase the requirements to place a citizen's petition for amendment on the ballot from 5% to 20%, (Item 2), But they are also considering abolishing the County Auditor and County Treasurer's offices, transferring them to Dept of Finance (Item 5B) AND abolishing the offices of elected County Clerk and County Attorney (Item 5C). For the finale, Item 7 proposes to allow the county the OPTION of publishing proposed amendments in a newspaper of general circulation in the county OR publishing on-line! I expect they thought that everyone would leave after the first item on the agenda. Democracy is at risk, big time! Our County Mayor has been fighting the peoples' interest to regulate pesticide use by the GMO Chemical companies. He vetoed the County Council Bill 2491 that had popular support and has shown little interest in defending the county in the following legal suit from the GMO companies. Forget about our county slowing down militarization or our police, the growth of GMO fields, or the paving over and upscale suburbanization of Kauai. This top down phenomena has been expressed in big-box corporate stores that shoot for the lowest common denominator and undersell Main Street local businesses; militarization and weaponizing of our local police departments in the name of security and safety; the erosion of personal freedom and rights in a trade-off for corporate interests and control. The answer does not lie in throwing out the bums and replacing them with the "goodguys". The "goodguys" who are willing to serve office honestly and with dedication are few and far between. The "goodguys" are often transformed by temptations or so outnumbered as to be ineffective. That doesn't mean to me that those who are dedicated should not try to maintain freedom and fairness. I does mean I do not expect much from the effort. In America this phenomena exists at every strata of government - Federal - State - County. They are all corrupted and in the thrall of money and personal security. The one-percenters and corporations hand them trinkets to our representatives to sell us down the river. My advise is to unravel yourself from dependence on government, corporate and the security apparatus as much as possible. Slip between the seams. Become invisible. Be self-reliant. FOOD: We will likely soon see how even temporary interruptions to food, power and infotainment (information & entertainment) systems will create havoc. Global warming will play a part in this with draughts, brown-outs and fire storms. In addition we will will likely have food shortages due to increasing GMO crop failures from insect and weed resistance to pesticides as well as increasing problems with the production of food dependent on antibiotics and hormones. Need I mention the health problems that are now being associated with HFCS and glyphosate ingestion. Heart disease, obesity, diabetes, celiac disease, autism, etc. Solution: Organically grow as much of your own food as possible. Trade for what you need and don't have. ENERGY: The bright energy future brought to you by fracking for oil and gas is about to become the dim past. Besides diverting huge amounts of water needed for other purposes the fracking industry poisons the water it uses and any water nearby. The drop-off in productivity in gas and oil wells is so dramatic as to be unprofitable. We cannot frack our way out of this problem. Moreover, we cannot nuke our way out of it either. Nuclear power will not save civilization. In fact it is capable of ending it all by itself. If you haven't noticed, nobody has a clue how to end the ongoing catastrophe that is Fukushima Daiichi. You will be long dead before that mess is "cleaned up". The entire northern Pacific Ocean is already effected. For those on the continental United States read up on meltdown at the Waste Isolation Pilot Plant (WIPP) in Carlsbad NM on last Valentine's Day. WIPP that is the only repository for all sorts nuclear paste (including plutonium and uranium). It has been shutdown for an unspecified duration and truckloads of nuclear waste are backing up at our crumbling 40 year old nuclear facilities. Solution: Use less and make your own. Your energy budget is set by your ability to utilize the energy from the sunshine that fall where you live. INFOTAINMENT: Read books, write letters, play an instrument. This is one time it is all about you. All this is not to say if you do all the right things you will find bliss. There is likely to be great variation in the negative effects of the PROBLEM we face. There will be hot-spots for ecological damage, industrial disasters, and government repression. War can exist anywhere. However, all-in-all the more self reliant you are, right now, where you are, the better your chances. Hello Juan, things are the same over here in Tennessee on the mainland as in Hawaii. We are following the same path and strategy that you are, creating as much independence as you are. Regarding government folks and in particular those who migrate to leadership positions, it is important to know that out of the 4 to 6 percent of the population at large who are psychopaths, the majority of political leaders are psychopaths. A good book to understand the how and why is "Snakes in Suits by Paul Babiak and Robert D. Hare. Psychopaths are intrinsically cowards. The way to combat these folks is to form a community of like minded folks separate from government and be ready to stand as a group against the coming declaration of war of the governments in the USA against its citizens. As Jesse Ventura says #stayvigilant.